With literally hundreds of feeds available for all of us to choose from for our horses the choice can be a bit overwhelming. While FeedXL is a brilliant tool in helping you see which feeds deliver the nutrients your horse needs and which don’t, what FeedXL can’t help you with is determining the actual quality of the feed. Nutrient profile and balance is one thing, but the ingredients used to make the feed are another thing entirely, and it is this aspect of feeding that you need to stay fully in control of. Things like the ingredients used to make a feed, the quality of protein in the feed, whether the feed is made to the same recipe or made using least cost batching methods, how it is processed and the facility it is made in all contribute to determining a feed’s quality. These aspects of feed quality are discussed in more detail below. When considering purchasing a feed have a look at the ingredients listed on the bag or label. First major rule is, if there are no ingredients listed, don’t buy the feed. This is not common but it does happen. If you have no idea what is in the feed then do not put it in your horse’s mouth. The ingredients list will give you a good indication of whether the feed is a high quality feed or not. When looking at an ingredient list you should take note of the actual ingredients used and the number of macro ingredients (the grains, pulses and oilseeds) used. Higher quality feeds will use more ‘whole’ ingredients like corn, barley, wheat, oats, rice, full fat soybeans, sunflower seeds, faba or field beans, lupins (if you are in a part of the world that uses lupins for horses) and linseed or flax and they will contain a big variety of ingredients. When I say ‘whole’, it doesn’t mean they are in the feed in a whole form, just that the entire ingredient is used in the feed and not just a part or a by-product of it. Higher quality feeds will also list the specific oils they use if any. Lower quality feeds will list more generic or lesser quality ingredients like protein meals, pollard and bran (which can come under many names including wheat midds, middlings, broll, millrun and millmix), cottonseed meal and unnamed vegetable oils and there will often be less than 5 macro ingredients used. Determining feed quality just from an ingredient list isn’t exactly cut and dried. For example, a lot of high quality feeds contain a component of pollard and bran, and used properly these ingredients do add value to a ration. However, if these lower quality ingredients appear to make up the majority of a feed AND the feed has only two or three main ingredients, the likelihood is that the feed is not going to give you as good a result as you could get from using a feed with better quality and more variety of ingredients. In short, look for higher quality ‘whole’ ingredients and lots of them in an ingredient list for a higher quality feed. Protein quality is one of, if not the major characteristic of a feed that determines its quality. If a feed contains poor quality protein your horse’s coat, hooves and muscle development will all suffer. The quality of protein is determined by the amount of essential amino acids (amino acids the horse can’t make for itself) in that protein source. Proteins that have a high concentration of the most limiting essential amino acids are considered good quality while proteins with low levels of essential amino acids are considered poor quality. The problem is, protein is usually displayed on feed labels as crude protein, which is simply calculated by multiplying the amount of nitrogen in a feed by 6.25. Nitrogen is in all protein and there is also ‘non-protein nitrogen’ sources so the crude protein really tells you nothing about the quality of protein in a feed. To determine the protein quality you should look at the feed’s ingredients to see where the protein is coming from. 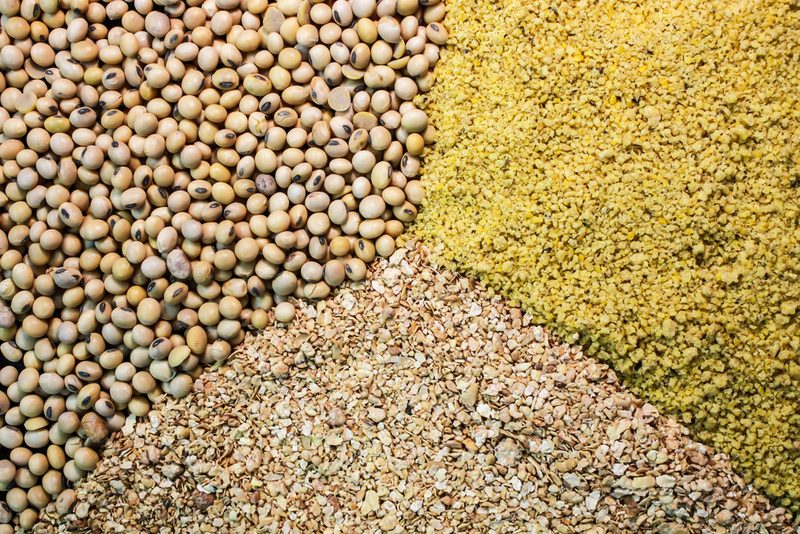 Feeds containing soybean, lupins, canola meal, faba or field beans will contain higher quality protein than feeds containing protein only from cereal sources (for example the wheat protein found in wheat midds/pollard and bran) or with protein from non-specified vegetable protein meals or cottonseed meal. 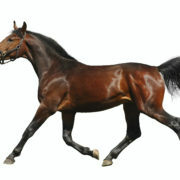 Lysine is what is called the first limiting amino acid in an equine diet because it is usually the one that is first to be too low in a horse diet and therefore becomes limiting (for growth, muscle development or whatever it is your horse needs protein for at the time). So looking at the level of lysine in a feed (and also in FeedXL) will give you an indication of the quality of protein in the feed. However, there are two problems with lysine. For learn more about protein quality, click here to read our article ‘Understanding Protein Quality in Horse Feed’. There are two main ways companies will ‘batch’ their feeds. The first is using least cost principles where the company will list a selection of ingredients on the label (using wording something like ‘ingredients selected from’ or broad wording like ‘cereal grains including barley, wheat and corn’) and then when they make the feed they will use whatever combination of these ingredients is the least expensive to meet the feed’s minimum requirements. Least cost batching is common practice in the pig and poultry industries and it is used to make horse feeds. While feeds made in this way will deliver the minimum nutrient specifications for each feed (so you will always get the specified level of energy, protein, vitamins and minerals) the ingredients used and thus the ingredient and protein quality can change from batch to batch. The second method of batching used is to use the same ingredients and the same recipe each time the feed is made. This batching method give a more consistent and often higher quality product than those made using least cost batching. If you are not sure which batching method your feed supplier uses and it is something you would like to know, you should contact and ask them. Another important factor determining quality is the standard of the facility used to make the feed. You should check with your feed supplier to see what sort of quality assurance programs they operate under (for example the Feed Safe program) and whether or not the mill is an equine dedicated mill (eliminating the risk of potentially fatal contamination of your feed with ingredients like ionophores (Rumensin)). Not all horses need to be fed high quality feeds. For example a good doer that is only in light work will more than likely do very nicely on good quality forage and if need be a small amount of a lower quality feed. 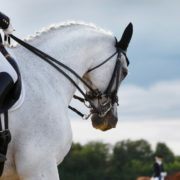 However, horses that are under a lot of physical pressure, for example broodmares that are breeding every year, young, growing horses, horses that need to gain a lot of body condition or build muscle mass and horses in heavy work will always do a lot better on a quality feed with good ingredients and high quality protein. The quality of forage your horse is eating also has an impact on how good a quality feed you need to feed for the best results. Horses on low quality forage, and particularly low quality C4 or subtropical type forage will always do better when fed a high quality feed with good quality protein. Horses on high quality forage will often do well when eating a lower quality feed. So when you are next choosing a feed for your horse take notice of what and how many ingredients are used and consider what the protein quality is likely to be. If it is important to you, look at how the feed is batched and check out the quality assurance programs used by the manufacturer. You then of course also need to make sure the feed fits into your horse’s diet in FeedXL. Using both your own knowledge of feed quality together with FeedXL’s calculations will always give you the best results. This newsletter by Dr. Nerida Richards was originally posted to the FeedXL user forums for FeedXL subscribers in May, 2012. If you would like to be among the first to receive our newsletters then please consider becoming a FeedXL member or subscribing to our email list. While there are many commercial feed and supplement options available, they can be classified into 3 broad categories; complete feeds, concentrates/balancer pellets and supplements. Depending on your own personal preferences you can use one or a combination of these options to put together a diet for your horse. 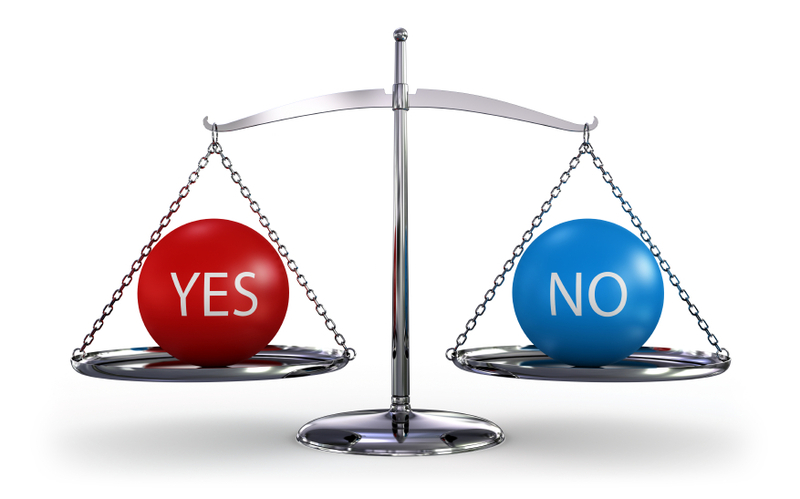 This article will take a look at what the 3 options are, how they should be used and the advantages and disadvantages of each one. A complete feed is a feed that has been formulated to meet the energy, protein, vitamin and mineral requirements of horses. They can be in the form of pellets, cubes, meal or sweetfeeds. Each complete feed will be formulated specifically for a certain type of horse. 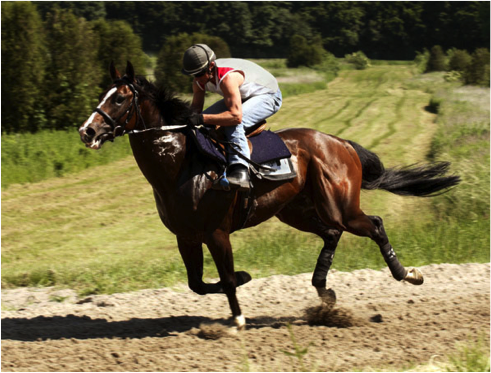 For example there are complete feeds for breeding horses, horses in sales preparation, pleasure horses, horses in hard work, horses that tie‐up … the list can go on and on. Complete feeds will contain a variety of ingredients which are usually some combination of grains and grain byproduct (wheat, barley, corn, oats, bran, pollard), legumes or oilseeds (soybean, faba bean, lupins and other protein meals like cottonseed), minerals like salt, limestone and dicalcium phosphate as well as a trace‐mineral and vitamin premix. Many also contain oil. For a complete feed to actually be “complete” when you use it in your horse’s diet, you must follow the manufacturer’s feeding recommendations for the feed. For example, a working horse feed will have a table on the bag that will say something like for a 500 kg horse in moderate work, you should feed 3 – 4 kg/day. If you feed less than this amount, your horse’s diet will not contain the required levels of vitamins and minerals and the feed will no longer be complete. A common problem people find with complete feeds is that these feeding rates are too high, with many owners exclaiming their horse would explode if it was fed that much. If this is the case, the complete feed may need to be “topped up” with an appropriate supplement. Using this approach allows you to control your horse’s calorie intake, without compromising vitamin and mineral intakes. Alternatively, if the feeding rates of complete feeds are always too high for your horse, consider using either a concentrate/balancer pellet or supplement. Complete feeds also don’t allow much flexibility in a feeding program, because deviating from the recommended feeding rates will mean you also unbalance your horse’s diet, so horses needing constant adjustment of their diet according to daily workload, bodyweight and temperament aren’t well suited to a complete feed. Keep in mind that not all “complete feeds” are created equally. 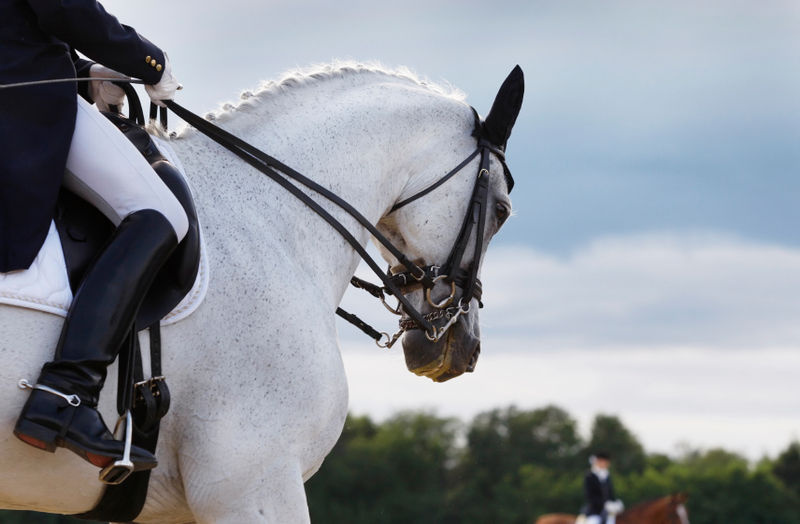 Some will do a very good job of meeting requirements when fed at the correct rates, while others will still leave many deficiencies in your horse’s diet, even when being fed at the recommended levels. This is where FeedXL is a big help—it allows you to easily see which complete feeds really are complete and which aren’t. Concentrates and balancer pellets are fed to meet a horse’s vitamins and mineral requirements, but unlike complete feeds, they only meet part of a horse’s energy and protein requirement. They can be in the form of pellets or sweetfeeds and have a feeding rate of between 0.5 kg and 2.5 kg/day. 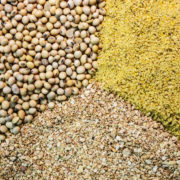 Concentrates and Balancer Pellets are designed to be fed in conjunction with other protein and energy sources like grains, legumes and oilseeds. They can also be fed alone when the horse has access to good quality pasture or is an easy keeper that doesn’t need the additional calories or protein. The major advantage of a concentrate or balancer pellet over a complete feed is that it allows you more flexibility within your feeding program. Once you find the required rate of concentrate or pellet your horse needs to meet vitamin and mineral requirements you can then customise the rest of the diet to suit your horse’s tastes and your budget. They also allow you to adjust the amount of calories or protein you feed according to your horse’s workload, weight or temperament without affecting vitamin and mineral intake. The major disadvantage of feeding in this manner is the time it takes to mix the feed. 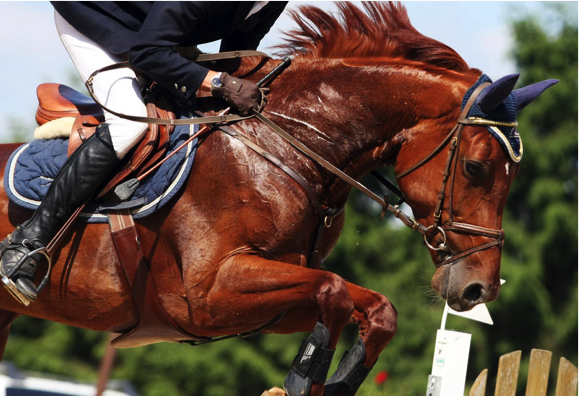 Vitamin and Mineral Supplements Supplements are fed to meet a horse’s vitamin and mineral requirements and do not contain any appreciable amounts of energy or protein. They have a feeding rate of up to 0.5 kg/day, with most supplements only fed at rates of 20 to 100 g/day, depending on the brand. Supplements are designed to be fed with grains, legumes and oilseeds, when needed, to make up a complete diet for horses. They may also be fed alone (mixed with a small amount of chaff or some other tasty base so the horses will eat them) to easy keepers when only vitamins and minerals need adding to the diet. Supplements are also commonly fed with a “complete feed” when the complete feed is being fed at less than the recommended rates to make up any shortfalls in vitamin and mineral intake that may be present. The major advantage of using a supplement‐based diet is the amount of flexibility you have in creating the diet, both from the horse’s perspective and your budget. The major disadvantage is again, the time it takes to source the ingredients and mix up the feeds. 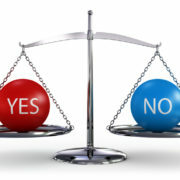 As for other commercial products, not all supplements are created equally. Some will do a very good job of meeting a horse’s requirements while others will do a mediocre job at best. Again, this is where FeedXL can be a big help in working out which do and which do not meet a horse’s requirements. When choosing a supplement, also be conscious of how much they are costing per dose (don’t look at the cost per pound/kilogram). Depending on your horse and your own personal preferences you will prefer to feed either with complete feeds, concentrates/balancer pellets or supplements. Complete feeds are simple to feed, provide good variety in the diet and are readily available. However they give you very little flexibility in how much you can feed, as not staying within recommended feeding rates will mean some of your horse’s requirements may not be met. Concentrates/balancer pellets and supplements give you more flexibility, can be fed alone to easy keepers and allow you to customise your feeding program according to your horse’s tastes and your budget. However, they can make the time taken to mix feed longer and you will often have to source more ingredients. Regardless of the feeding or mixing method you choose, always balance your horse’s diets. Weigh your horse to get the feeding rates right and so that FeedXL can correctly estimate your horse’s requirements. Only in this way can you be sure that the complete feed, balancer or supplements you choose are working correctly for you and your horse. This newsletter by Dr. Nerida Richards was originally posted to the FeedXL user forums for FeedXL subscribers in November, 2009. If you would like to be among the first to receive our newsletters then please consider becoming a FeedXL member or subscribing to our email list. There is nothing more pleasing to a horse owner’s eye than a brilliant, shiny coat. 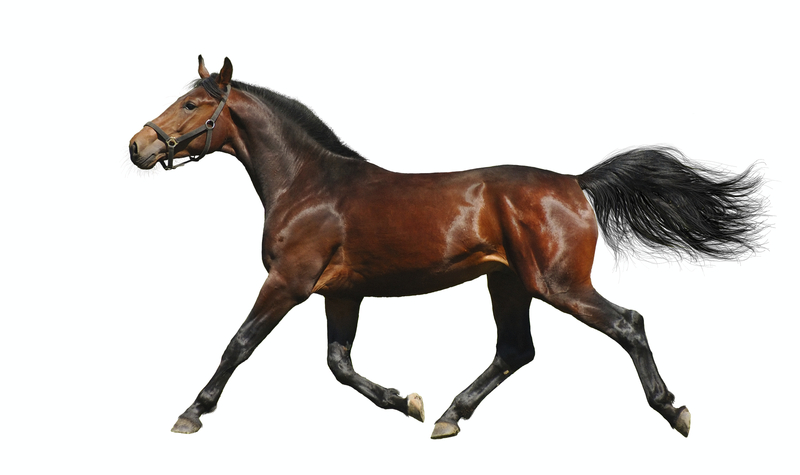 And aside from looking great, a shiny coat also indicates the horse is healthy inside and out. Question is, how do you make your horse shine? It is really quite easy if you follow these simple steps. Many nutrients including protein, copper, zinc and vitamin A have a direct impact on the health and shine of your horse’s coat. These nutrients as well as all of the other essential nutrients must be provided in your horse’s diet at levels that will meet your horse’s requirements . If you don’t keep your horse healthy on the inside you can’t possibly expect the outside to shine. This is why FeedXL is so good, it makes balancing your horse’s diet for good coat shine simple! 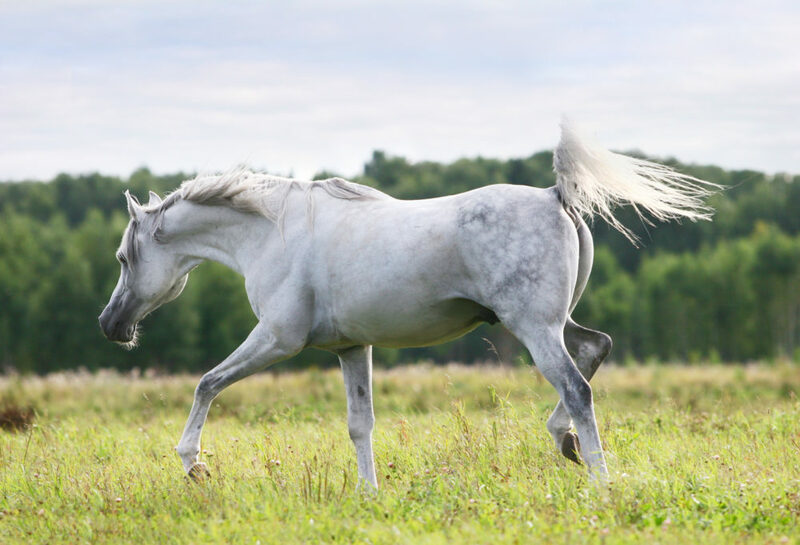 If your horse’s diet is low in oils, and in particular, low in the essential fatty acids omega 3 and omega 6 it will probably mean your horse’s coat will be dull. Adding 1/8 to 1/4 of a cup of oil to the diet will help bring shine to the coat. Add oilseeds such as sunflower seeds, micronised or extruded full fat soybean, or boiled flax/linseed to the diet. Add liquid oils to the diet. Almost all oils will have a positive impact on coat shine. Cold pressed canola or soybean oil or any oils that have been fortified with omega fatty acids are particularly effective. Rice bran oil and coconut oil are also good for coats. If you use a complete feed, choose one that contains ingredients like full fat soybean, sunflower seeds and cold pressed oils. It is well known that feeds containing molasses will make a palomino’s coat go ‘smutty’ or dark in colour, while it will bring a deep liver colour out in chestnuts that have the genetics to go that colour. So if you are after a darker coat, try feeding molasses (1/4 to 1 cup per day). NB Don’t feed molasses to horses prone to laminitis. Products containing a compound known as gamma oryzanol are also often reported to darken coats. Gamma oryzanol is found naturally in rice bran and can also be purchased in a purified form (Google gamma oryzanol and horses). Nothing will take the shine off a horse’s coat faster than a heavy worm burden, so be sure to worm regularly and follow a good worming rotation schedule. Brushing regularly will remove dead hair from your horse’s coat and will stimulate the horse’s sebaceous glands which release oils that cause the hair to lie flat and shine. I can’t stress enough how important step 1 is. Balance the diet and make sure all of your horse’s nutrient requirements are met. If you build on this foundation, adding the extra touches for an amazing coat shine is simple. This newsletter by Dr. Nerida Richards was originally posted to the FeedXL user forums for FeedXL subscribers in June, 2009. If you would like to be among the first to receive our newsletters then please consider becoming a FeedXL member or subscribing to our email list. Bodyweight Estimation: Which Method Is Best? Bodyweight estimation—which method is best? Having an accurate bodyweight for your horse is critical when formulating your horse’s diet. 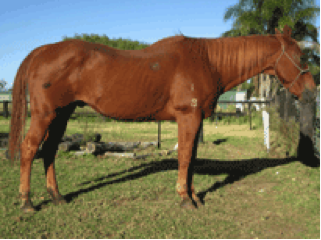 Overestimating your horse’s bodyweight may mean you feed too much, resulting in weight gain and wasted money on feed that is surplus to your horse’s needs. Underestimating could result in underfeeding your horse, possibly causing weight loss and nutrient deficiencies. How to do it … better! 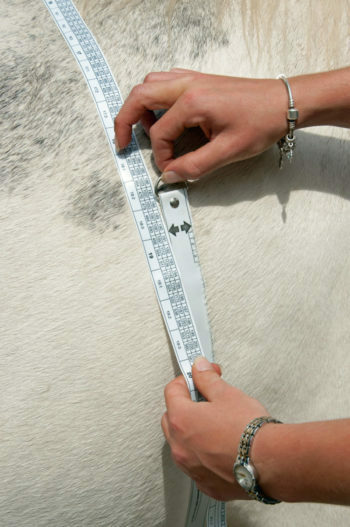 Weight tapes – you place a specially marked tape around your horse’s girth and it gives you an estimated weight. Height and Condition score – using your horse’s height and body condition score and a published weight table, you can look up your horse’s estimated weight. But how accurate are these methods? The weight tape was the least accurate method, overestimating the weight of these horses by an average of 8.3% (meaning all nutrient requirements will also be overestimated by 8.3%). The Height/Condition Score method was a bit better, only overestimating the weight by 3%. The Girth and Length method is the best, underestimating the bodyweights by an average of 1%. An accurate bodyweight is essential if you want to balance your horse’s diet correctly. Be very careful when estimating your horse’s bodyweight. If you cannot weigh your horse on livestock scales we recommend you use the Girth and Length method to estimate your horse’s bodyweight as it will give you the closest estimate to your horse’s actual bodyweight. This is the method we use to help you estimate your horse’s bodyweight in FeedXL. This newsletter by Dr. Nerida Richards was originally posted to the FeedXL user forums for FeedXL subscribers in April, 2009. If you would like to be among the first to receive our newsletters then please consider becoming a FeedXL member or subscribing to our email list. https://feedxl.com/wp-content/uploads/2014/04/iStock_000010816729Small.jpg 547 877 Dr Nerida Richards https://feedxl.com/wp-content/uploads/2017/08/FeedXL-header-logo-300W.png Dr Nerida Richards2009-04-28 12:16:442019-03-02 06:32:03Bodyweight Estimation: Which Method Is Best? How much should you feed your horse? The question is, how do you know how much to feed your horse? The first golden rule of horse feeding is always feed your horse a minimum of 1% of its bodyweight per day of forage. So for a 500 kg horse, the absolute minimum amount of hay, pasture and chaff it should have access to per day is 5kg. Your horse should preferably be fed around 2% of its bodyweight per day as forage. Feeding this amount of forage will keep your horse’s gut healthy, keep your horse happy and help prevent colic and gastric ulcers. The question then is, is this amount of forage enough to maintain your horse’s bodyweight? 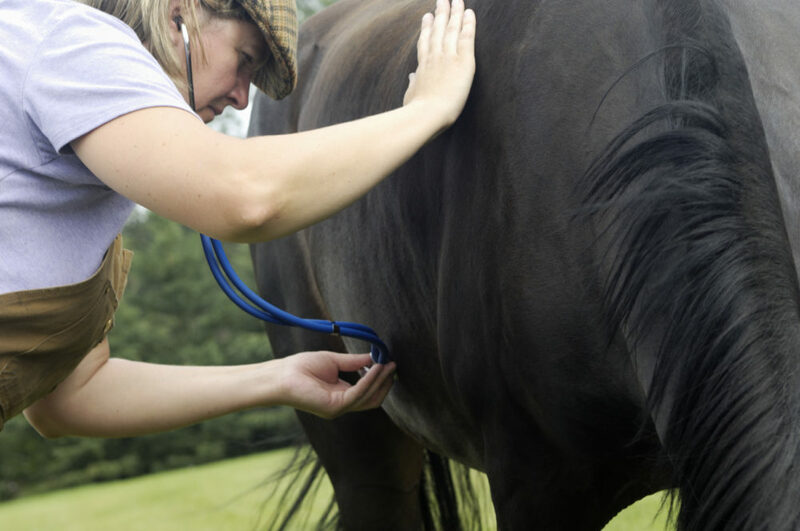 The only way you can answer this question is by regularly condition scoring your horse. Condition scoring is a practice used to determine the amount of body fat your horse is carrying and will give you an indication over time whether your horse is gaining, holding or losing weight. This in turn helps to fine tune your horse’s diet. 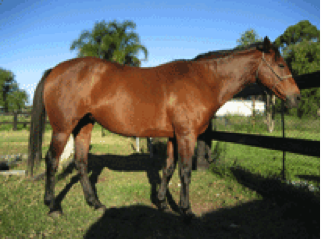 Condition scoring of horses involves an assessment of certain parts of a horse’s body for ‘fatness’. 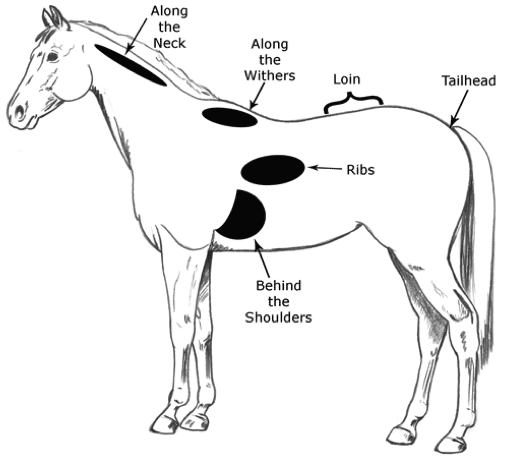 The most commonly used sites are the along the neck, along the withers, the loin, tailhead, ribs and behind the shoulder as shown below. 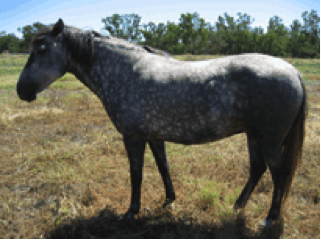 Once an assessment of these areas of the horse’s body is made, a system developed by researchers at the Texas A&M University, USA (Henneke et al. 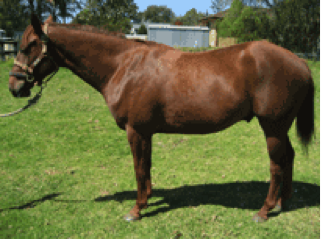 1983), may be used to assign a ‘score’ to reflect your horse’s level of body fatness. This condition scoring system presents condition scores on a scale of 1 to 9, with 1 being extremely emaciated and 9 being extremely fat. 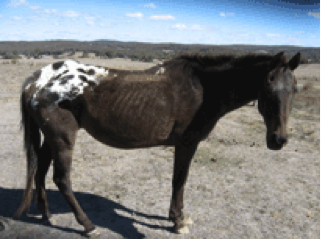 The horse is extremely emaciated. The bone structures of the neck, wither and shoulders are easily visible. The ribs, backbone and tailhead project prominently. 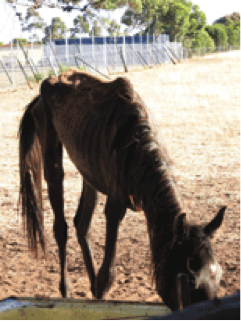 The horse is emaciated. The bone structures of the neck, wither and shoulders are faintly discernable. The structure of the ribs, backbone and tailhead are prominent. The structure of the neck, wither and shoulders are accentuated. There is a slight fat cover over the ribs but they remain easy to see. The vertebrae of the backbone are easily discernable and the tailhead is prominent but the bone structure of the tailhead is not obvious. The neck, wither and shoulders are not obviously thin. A faint outline of the ribs is visible, the backbone projects upward slightly and some fat can be felt around the tailhead. The prominence of the tailhead will depend on the horse’s conformation. 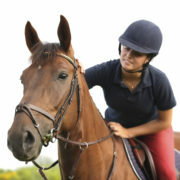 The neck and shoulders blend smoothly into the body and the withers are rounded. The ribs cannot be seen but are easily felt, the area over the loin is flat and the fat deposited around the tailhead begins to feel spongy. Fat is beginning to be deposited along the neck and withers and behind the shoulder. The ribs can still be felt but the fat cover over the ribs feels spongy. There may be a slight crease or gutter down the back and the fat around the tailhead feels soft. Fat is deposited along the neck, wither and behind the shoulder. Individual ribs can still be felt but there is a noticeable filling of fat between the ribs. There may be a crease or gutter down the back over the loin area and the fat around the tailhead will be soft. The neck is noticeably thickened with fat, the area along the wither is filled with fat and the area behind the shoulder is flush with the body. It is difficult to feel the ribs, there will likely be a gutter down the horses back and the fat around the tailhead will feel very soft. The neck, wither and the area behind the shoulders are bulging with fat. Patchy fat can be seen over the ribs, there is an obvious gutter down the centre of the back and the area around the tailhead bulges with fat. What condition score should your horse be in? 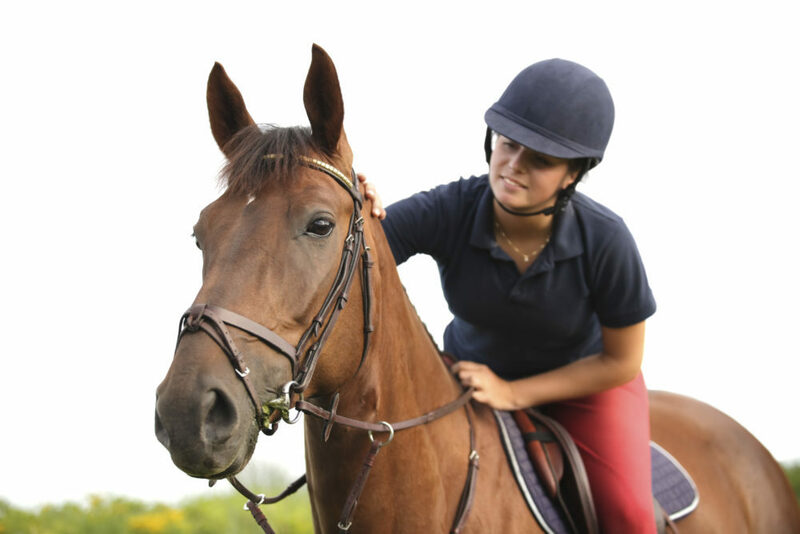 Depending on what your horse is doing, its optimum condition score will be somewhere between a score of 4 and 7. The table below gives you an indication of the best condition score for your horse. Growing Horse 5 Higher condition scores indicate that the diet contains too much feed. The increased body weight at a higher condition score will put excess pressure on immature joints and increases the risk of developmental orthopaedic diseases. Pregnant and/or Lactating Mare 5 – 7 Lower or higher body condition scores can reduce fertility and conception rates and decrease milk production. 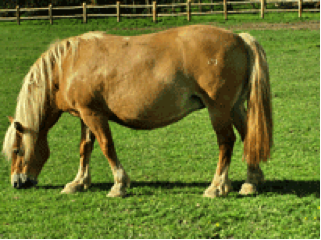 Breeding Stallion 5 Lower or higher body condition scores may decrease a stallion’s reproductive performance. Performance Horse 5 Horses with lower scores will not have sufficient body fat to use as a reserve source of energy during prolonged or frequent physical activity. 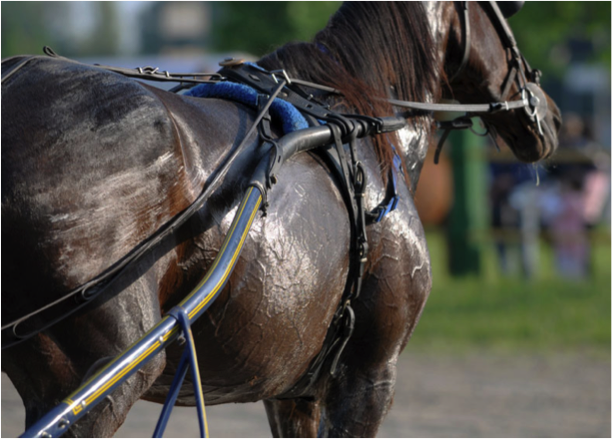 Horses with higher condition scores will have increased body heat production, reduced body heat loss and higher heart and respiratory rates. All of these factors will reduce performance. Excess weight also increases the strain placed on the skeletal system. 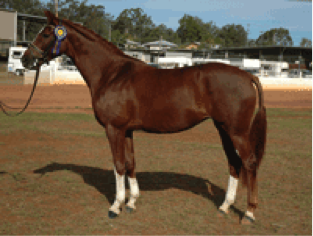 Idle Horse 4 – 6 Will vary depending on the individual horse, climate and season. If your horse has a lower condition score than it should, you need to feed more. 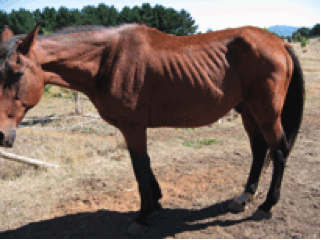 If your horse has a higher condition score than it should have, you need to feed less. FeedXL helps you to adjust your horse’s diet according to the horse’s body condition score and whether it needs to gain or lose weight, making knowing how much to feed and what to feed to your horse simple. When entering your horse’s details into FeedXL it asks you your horse’s body condition score, if your horse is an easy keeper (gains weight easily), normal keeper or hard keeper (loses weight easily) and if you want your horse to lose, hold or gain weight. Using the answers to those questions, FeedXL will adjust your horse’s estimated energy (calorie) requirements to help you achieve your horse’s body weight goals. All you need to do is meet these estimated energy requirements with a green bar in FeedXL and then continue to monitor your horse’s condition score to keep track of progress. This newsletter by Dr. Nerida Richards was originally posted to the FeedXL user forums for FeedXL subscribers in March, 2009. If you would like to be among the first to receive our newsletters then please consider becoming a FeedXL member or subscribing to our email list. 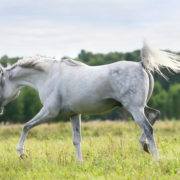 https://feedxl.com/wp-content/uploads/2013/03/Fotolia_17243686_XL-arabian-e1511594539977.jpg 681 1000 Dr Nerida Richards https://feedxl.com/wp-content/uploads/2017/08/FeedXL-header-logo-300W.png Dr Nerida Richards2009-03-01 12:10:182019-04-09 01:09:26Why Body Condition Score?